Bedrock geologic map illustrating the main geologic regions of Minnesota. Igneous bodies lie across the northern half of the state, with intrusions throughout the northwest and basalts and other igneous rocks of the Duluth Complex and Beaver Bay Complex from the Midcontinent Rift System bordering Lake Superior in the northeast. In the southeast along the Mississippi River, up through the Twin Cities, canyons carve into Cambrian and Ordovician bedrock that were formed in shallow tropical seas that covered southern and south-central Minnesota during that time. The geology of the southwest includes old rocks, the 3.6 billion year old Morton Gneiss and the Paleoproterozoic Sioux Quartzite, overlain by the Cretaceous sedimentary sequence that includes the Dakota Sandstone, Niobrara Formation, and Pierre Shale, and is continuous across much of the western Midwest to the eastern slopes of the Rocky Mountains. Central Minnesota contains an ancient fault system from the Penokean orogeny. The geology of Minnesota comprises the rock, minerals, and soils of the U.S. state of Minnesota, including their formation, development, distribution, and condition. The state's geologic history can be divided into three periods. The first period was a lengthy period of geologic instability from the origin of the planet until roughly 1,100 million years ago. During this time, the state's Precambrian bedrock was formed by volcanism and the deposition of sedimentary rock and then modified by processes such as faulting, folding and erosion. In the second period, many layers of sedimentary rock were formed by deposition and lithification of successive layers of sediment from runoff and repeated incursions of the sea. In the third and most recent period starting about 1.8 million years ago, glaciation eroded previous rock formations and deposited deep layers of glacial till over most of the state, and created the beds and valleys of modern lakes and rivers. Minnesota’s geologic resources have been the historical foundation of the state's economy. Precambrian bedrock has been mined for metallic minerals, including iron ore, on which the economy of Northeast Minnesota was built. Archaen granites and gneisses, and later limestones and sandstones, are quarried for structural stone and monuments. Glacial deposits are mined for aggregates, glacial till and lacustrine deposits formed the parent soil for the state's farmlands, and glacial lakes are the backbone of Minnesota's tourist industry. These economic assets have in turn dictated the state's history and settlement patterns, and the trade and supply routes along the waterways, valleys and plains have become the state's state's transportation corridors. Map of Minnesota bedrock by age. Minnesota contains some of the oldest rocks on Earth, granitic gneisses that formed some 3,600 mya (million years ago) — roughly 80% the age of the planet. About 2,700 mya, the first volcanic rocks that would later underlie Minnesota began to rise up out of an ancient ocean, forming the Superior craton. This craton later assembled into the Canadian shield, which became part of the North American craton. Much of the underlying gneiss rock of today's state had already formed nearly a billion years earlier, but lay underneath the sea. Except for an area where islands appeared in what is now the northern part of the state, most of the region remained underwater. In Middle Precambrian time, about 2,000 mya, the land rose above the water. Heavy mineral deposits containing iron had collected on the shores of the receding sea to form the Mesabi, Cuyuna, Vermilion, and Gunflint iron ranges from the center of the state north into Northwestern Ontario, Canada. These regions also showed the first signs of life as algae grew in the shallow waters. Over 1,100 mya, a rift formed and lava emerged from cracks along the edges of the rift valley. This Midcontinent Rift System extended from the lower peninsula of Michigan north to the current Lake Superior, southwest through the lake to the Duluth area, and south through eastern Minnesota down into what is now Kansas. The rifting stopped before the land could become two separate continents. About 100 million years later, the last volcano went quiet. Five hundred fifty million years ago, the state was repeatedly inundated with water of a shallow sea that grew and receded through several cycles. The land mass of what is now North America ran along the equator, and Minnesota had a tropical climate. Small marine creatures such as trilobites, coral, and snails lived in the sea. The shells of the tiny animals sank to the bottom, and are preserved in limestones, sandstones, and shales from this era. Later, creatures resembling crocodiles and sharks slid through the seas, and fossil shark teeth have been found on the uplands of the Mesabi Range. During the Mesozoic and Cenozoic other land animals followed as the dinosaurs disappeared, but much of the physical evidence from this era has been scraped away or buried by recent glaciation. The rock units that remain in Minnesota from this time period are of Cambrian and Ordovician age, from the Mount Simon Sandstone at the bottom of the sequence of sedimentary rocks to the Maquoketa Group at the top. 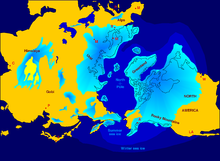 Northern hemisphere glaciation during the last ice ages. The creation of 3 to 4 km thick ice sheets caused a global sea level drop of about 120 m.
This glaciation has drastically remodeled most of Minnesota, and all but two of the state's regions are covered with deep layers of glacial till. The driftless area of Southeastern Minnesota was untouched by the most recent glaciation. In the absence of glacial scouring and drift, this region presents a widespread highly dissected aspect absent from other parts of the state. Northeastern Minnesota was subject to glaciation and its effects, but its hard Archaen and Proterozoic rocks were more resistant to glacial erosion than the sedimentary bedrock first encountered in many other regions, and glacial till is relatively sparse. While the effects of glacial erosion are clearly present and there are some areas of glacial till, older rocks and landforms remain unburied and exposed across much of the region. The Mesabi and Gunflint Ranges, once part of a single mountain range, were split when the center was engulfed by magma blistering up during the Midcontinent Rift, creating the Duluth Complex. Lava from the rift formed dense volcanic rocks which sank, creating the Lake Superior basin, edged by the North Shore Volcanic Group along the lakeshore. Known as the Arrowhead for its shape, this region shows the most visible evidence of the state's violent past. There are surface exposures of rocks first formed in volcanic activity some 2,700 mya during construction of the Archaen-Superior province,  including Ely greenstone, metamorphosed and highly folded volcanics once thought to be the oldest exposed rock on earth;  Proterozoic formations created about 1,900 mya that gave the area most of its mineral riches; and more recent intrusive gabbro and extrusive basalts and rhyolites of the Duluth Complex and North Shore Volcanic Group, created by magma and lava which upwelled and hardened about 1,100 mya during the Midcontinent Rift. The Precambrian bedrock formed by this activity has been eroded but remains at or close to the surface over much of the area. In post-glacial times Northeastern Minnesota was covered by forest broken only by these interconnected lakes and wetlands. Much of the area has been little changed by human activity, as there are substantial forest and wilderness preserves, most notably the Boundary Waters Canoe Area and Voyageurs National Park. In the remainder of the region, lakes provide recreation, forests are managed for pulpwood, and the underlying bedrock is mined for valuable ores deposited in Precambrian times. While copper and nickel ores have been mined, the principal metallic mineral is iron. Three of Minnesota's four iron ranges are in the region, including the Mesabi Range, which has supplied over 90% of the state's historic output, including most of the natural ores pure enough to be fed directly into furnaces. The state's iron mines have produced over three and a half billion metric tons of ore. While high-grade ores have now been exhausted, lower-grade taconite continues to supply a large proportion of the nation's needs. Bedrock in this region is mainly Archean, with small areas of Lower Paleozoic and Upper Mesozoic sedimentary rocks along the western border. By late Wisconsinan times this bedrock had been covered by clayey glacial drift scoured and transported from sedimentary rocks of Manitoba. The bottomland is undissected and essentially flat, but imperceptibly declines from about 400 meters at the southern beaches of Lake Agassiz to 335 meters along the Rainy River. There is almost no relief, except for benches or beaches where Glacial Lake Agassiz stabilized for a time before it receded to a lower level. In contrast to the lakebed, these beaches rise from the south to the north and east at a gradient of approximately 1:5000; this rise resulted from the isostatic rebound of the land after recession of the last ice sheet. In the western part of the region in the Red River Valley, fine-grained glacial lake deposits and decayed organic materials up to 50 meters in depth form rich, well-textured, and moisture-retentive, yet well-drained soils ( mollisols), which are ideal for agriculture. To the north and east, much of the land is poorly drained peat, often organized in rare and distinctive patterns known as patterned peatland. At marginally higher elevations within these wetlands are areas of black spruce, tamarack, and other water-tolerant species. Relief map of Southwestern Minnesota, transected by the Minnesota River in the valley of the glacial River Warren. To the northwest, the faint U-shaped Big Stone Moraine; the triangular wedge in the southwest is the Coteau des Prairies. The rough-appearing areas to the north and east are part of Central Minnesota. Drier than most of the rest of the state, the region is a transition zone between the prairies and the Great Plains. Once rich in wetlands known as prairie potholes,  90%, or some three million acres (12,000 km²), have been drained for agriculture in the Minnesota River basin. Most of the prairies are now farm fields. Due to the quaternary and bedrock geology of the region, as well as the reduced precipitation in the region, groundwater resources are neither plentiful, nor widely distributed, unlike most other areas of the state. Given these constraints, this rural area hosts a vast network of water pipelines which transports groundwater from the few localized areas with productive groundwater wells to much of the region's population. Relief map of Southeastern Minnesota: Owatonna Moraine on extreme west; junction of the state's principal rivers in Central Minnesota in northwest; the Wisconsin border along the Mississippi River to the east. The bedrock here is lower Paleozoic sedimentary rocks, with limestone and dolomite especially prevalent near the surface. It is highly dissected, and local tributaries of the Mississippi have cut deep valleys into the bedrock. It is an area of karst topography, with thin topsoils lying atop porous limestones, leading to formation of caverns and sinkholes. The last glaciation did not cover this region (halting at the Des Moines terminal lobe mentioned above), so there is no glacial drift to form subsoils, giving the region the name of the Driftless area. As the topsoils are shallower and poorer than those to the west, dairy farming rather than cash crops is the principal agricultural activity. Map of soils and sediments constituting Quaternary geology of Minnesota. Central Minnesota is composed of (1) the drainage basin of the St. Croix River (2) the basin of the Mississippi River above its confluence with the Minnesota, (3) those parts of the Minnesota and Red River basins on the glacial uplands forming the divides of those two basins with that of the Mississippi, (4) the Owatonna Moraine atop a strip of land running from western Hennepin County south to the Iowa border, and (5) the upper valley of the Saint Louis River and the valley of its principal tributary the Cloquet River which once drained to the Mississippi before they were captured by stream piracy and their waters were redirected through the lower Saint Louis River to Lake Superior. Glacial landforms are the common characteristics of this gerrymander-like region. At the surface, the entire region is "Moraine terrain", with the glacial landforms of moraines, drumlins, eskers, kames, outwash plains and till plains, all relics from recent glaciation. In the multitude of glacier-formed depressions are wetlands and many of the state's "10,000 lakes", which make the area prime vacation territory. The glacial deposits are a source of aggregate, and underneath the glacial till are high-quality granites which are quarried for buildings and monuments. Relief map of the eastern part of Central Minnesota: Mississippi River enters from northwest and crosses diagonally to the southeast; Minnesota River in the valley of River Warren enters from the south; St. Croix enters from northeast. East Central Minnesota is composed of the eastern half and all territory on the image north of the Mississippi. The subregion of East Central Minnesota is that part of Central Minnesota near the junction of three of the state's great rivers. Included are Dakota County, eastern Hennepin County, and the region north of the Mississippi but south of an east-west line from Saint Cloud to the St. Croix River on the Wisconsin border. It includes much of the Twin Cities metropolitan area. The region has the same types of glacial landforms as the remainder of Central Minnesota, but is distinguished by its bedrock valleys, both active and buried. The valleys now hold three of Minnesota's largest rivers, which join here. The St. Croix joins the Mississippi at Prescott, Wisconsin. Upstream, the Mississippi is joined by the Minnesota River at historic Fort Snelling. When River Warren Falls receded past the confluence of the much smaller Upper Mississippi River, a new waterfall was created where that river entered the much-lower River Warren. The new falls receded upstream on the Mississippi, migrating eight miles (13 km) over 9600 years to where Louis Hennepin first saw it and named St. Anthony Falls in 1680. Due to its value as a power source, this waterfall determined the location of Minneapolis. One tributary of the river coming from the west, Minnehaha Creek, receded only a few hundred yards from one of the channels of the Mississippi. Minnehaha Falls remains as a picturesque and informative relic of River Warren Falls, and the limestone-over-sandstone construction is readily apparent in its small gorge. At St. Anthony Falls, the Mississippi dropped 50 feet (15 m) over a limestone ledge; these waterfalls were used to drive the flour mills that were the foundation for the city's 19th century growth. Other bedrock tunnel valleys lie deep beneath till deposited by the glaciers which created them, but can be traced in many places by the Chain of Lakes in Minneapolis and lakes and dry valleys in St. Paul. ^ Ojakangas and Matsch, Minnesota's Geology, p. 23. ^ Ojakangas and Matsch, Minnesota's Geology, pp. 25-32. ^ "Minnesota". America’s Volcanic Past: Places. U.S.Geological Survey, Cascades Volcanic Observatory. Archived from the original on 2009-01-10. Retrieved 2007-06-30. ^ a b "Natural History - Minnesota's Geology". Minnesota Dept. of Natural Resources. 2007. Archived from the original on October 10, 2006. Retrieved 2007-06-30. ^ Van Schmus et al., The Midcontinent Rift System, pp. 345, 349. ^ Ojakangas and Matsch, Minnesota’s Geology, pp. 57-59. ^ Townsend, Catherine L.; John T. Figge (2002). "Dance of the Giant Continents". Northwest Origins. Burke Museum of History and Culture, University of Washington. Retrieved 2007-04-02. ^ Ojakangas and Matsch, Minnesota’s Geology, p. 65. ^ Ojakangas and Matsch, Minnesota’s Geology, pp. 65-95. ^ Ojakangas and Matsch, Minnesota's Geology, pp. 91-93. ^ Ojakangas and Matsch, Minnesota’s Geology, pp. 97, 108. ^ a b Lusardi, B.A. (1997). "Quaternary Glacial Geology" (PDF). Minnesota at a Glance. Minnesota Geological Survey, University of Minnesota. Archived from the original (PDF) on 2007-02-03. Retrieved 2007-06-30. ^ Ojakangas and Matsch, Minnesota’s Geology, pp. 116-18. ^ Jirsa and Southwick, Mineral Potential and Geology of Minnesota, Glacial cover in Minnesota. ^ "Elevations and Distances in the United States". U.S Geological Survey. 2005. Retrieved 2007-06-30. ^ Ecological Classification System, Ecological Land Classification Hierarchy. ^ Ecological Classification System, Northern Superior Uplands Section. ^ Van Schmus et al., The Midcontinent Rift System, p. 348. ^ Chandler, A Geophysical Investigation of the Ely Greenstone Belt in the Soudan Area Archived November 28, 2007, at the Wayback Machine, pp. 4-5; Nute, Rainy River Country, p. 3. Older rocks have since been found in Minnesota (the Morton gneiss of Southeast Minnesota) and Greenland and Labrador. Ojakangas and Matsch, Minnesota's Geology, p. 24. ^ Sansome, Minnesota Underfoot: A Field Guide to Minnesota's Geology, pp. 19, 30, 36; Ojakagas and Matsch, Minnesota's Geology, pp. 37-40, 50-55, 191. ^ Heinselman, The Boundary Waters Wilderness Ecosystem, pp. 13–14. ^ Ojakangas and Matsch, Minnesota’s Geology, pp. 185, 190-91. ^ Morey, G. B. (February 1999). "High-grade iron ore deposits of the Mesabi Range, Minnesota; product of a continental-scale Proterozoic ground-water flow system". Economic Geology. 94 (1): 133–42. doi: 10.2113/gsecongeo.94.1.133. ^ Compare regional map at Sansome, Minnesota Underfoot at p. 173, with image showing Herman Beach at Ojakanas and Matsch, Minnesota’s Geology, at p. 201. The upland portions of the Red River watershed atop the moraine are different in character, with gravelly soil, lakes, and other glacial landforms, and therefore are assigned to the Central Minnesota region. ^ Ecological Classification System, Tallgrass Aspen Parklands Province. ^ Ecological Classification System, Red River Valley Section. ^ Sansome, Minnesota Underfoot, p. 9 ("Bedrock Geology Map"). ^ Heinselman, Forest Sites, Bog Processes, and Peatland Types in the Glacial Lake Agassiz Region, Minnesota, p. 331. ^ Sansome, Minnesota Underfoot, p. 174, 181. ^ Heinselman, Forest Sites, Bog Processes, and Peatland Types in the Glacial Lake Agassiz Region, Minnesota, pp. 354-61; Sansome, Minnesota Underfoot, pp. 191-93. ^ "Patterned peatlands near Ludlow Lookout, Northern Beltrami County, MN". Aerial photograph. USGS via Microsoft Research Maps. Retrieved 2007-06-30. ^ Ojakangas and Matsch, Minnesota’s Geology, p. 223; Sansome, Minnesota Underfoot, pp. 110-11. ^ "U.S. Wind Energy Projects — Minnesota". The American Wind Energy Association. Archived from the original on April 5, 2008. Retrieved 2008-04-07. ^ "History". Jeffers Petroglyphs. Minnesota Historical Society. Retrieved 15 January 2011. ^ "Map". Wetlands Component Assessment Regions. National Resources Conservation Service, United States Department of Agriculture. Retrieved 2007-06-30. ^ a b "Wetlands". Fact Sheets. Minnesota River Basin Data Center, Minnesota State University, Mankato. Retrieved 2007-06-30. ^ Minnesota’s Geology, p. 222 (map). ^ Sansome, Minnesota Underfoot, p. 110. ^ Ecological Classification System, Paleozoic Plateau Section. ^ Sansome, Minnesota Underfoot, p. 129-31. ^ While Sansome places the north bank of the Minnesota River in this region, this article follows Ojakangas and Matsch in assigning the lowlands along the north bank to Southwest Minnesota, and the uplands to Central Minnesota. Compare regional map at Sansome, Minnesota Underfoot at p. 109, with Ojakanas and Matsch, Minnesota’s Geology, at p. 222. ^ Sansome, Minnesota Underfoot, p. 9 ("Bedrock Geologic Map"). ^ Ojakangas and Matsch, Minnesota’s Geology, p. 59. ^ Ojakangas and Matsch attach the metropolitan area to Southeastern Minnesota. Minnesota’s Geology, p. 232 (map). ^ Anoka Conservation District. "Geologic History of the Anoka Sandplain". Guide to Anoka County's Natural Resources. Anoka County. Retrieved 2007-04-03. ^ Black, Robert F. (2005). "Chapter 10: St. Croix Dalles Interstate Park". Geology of Ice Age National Scientific Reserve of Wisconsin, NPS Scientific Monograph No. 2. National Park Service. Retrieved 2007-06-30. ^ Jol, Harry M. (2006). "Interstate State Park, A Brief Geologic History". University of Wisconsin at Eau Claire. Archived from the original on 2012-12-15. Retrieved 2007-06-30. Chandler, Val W (2005-08-03). "A Geophysical Investigation of the Ely Greenstone Belt in the Soudan Area, 4-5" (PDF). Open File Report 05-1. Minnesota Geological Survey. Archived from the original (PDF) on 2007-11-28. Retrieved 2007-06-30. "Ecological Classification System". Minnesota Department of Natural Resources. 2008. Retrieved 2008-05-03. Jirsa, Mark and Southwick, David. "Mineral Potential and Geology of Minnesota". Minnesota Geological Survey, University of Minnesota. 2003-12-01. Retrieved 2008-04-13. Lusardi, B.A. (1997). "Quaternary Glacial Geology" (PDF). Minnesota at a Glance. Minnesota Geological Survey, University of Minnesota. Archived from the original (PDF) on 2007-02-03. Retrieved 2007-06-30. Morey, G. B. (February 1999). "High-grade iron ore deposits of the Mesabi Range, Minnesota; product of a continental-scale Proterozoic ground-water flow system". Economic Geology. Society of Economic Geologists. 94 (1): 133–42. doi: 10.2113/gsecongeo.94.1.133. Nute, Grace Lee (1950). Rainy River Country. Saint Paul: Minnesota Historical Society. Townsend, Catherine L.; Figge, John T. (2002). "Dance of the Giant Continents". Northwest Origins. Burke Museum of History and Culture, University of Washington. Retrieved 2007-12-15. Van Schmus, W. R.; Hinze, W. J. (May 1985). "The Midcontinent Rift System" (PDF). Annual Review of Earth and Planetary Sciences. Annual Reviews. 13: 348. Bibcode: 1985AREPS..13..345V. doi: 10.1146/annurev.ea.13.050185.002021. Retrieved 2007-06-30. Upham, Warren (1896). "The Glacial Lake Agassiz". Monographs of the United States Geological Survey. United States Geological Survey. XXV. Archived from the original on 2009-05-23. Retrieved 2009-04-16.